The UK government of 2010-2015 was the first UK coalition since 1945 and faced the consequences of the 2008 financial crash. In Politics: Between the Extremes, former Deputy Prime Minister and Liberal Democrat leader Nick Clegg explains the challenges of being the small, Liberal partner in the coalition, and argues forcefully for the importance of a politics of compromise. Joe Devanny focuses on what Clegg says (and does not say) about foreign and security policy, lamenting the failure to provide greater insight into the key debates that shaped Britain’s relationship with the world during the Coalition government. If you are interested in this book, you may like to listen a podcast recording of Nick Clegg’s public lecture on ‘Politics: Between the Extremes’, recorded at LSE on 15 September 2016. Politics: Between the Extremes. Nick Clegg. Bodley Head. 2016. Nick Clegg’s new memoir, Politics: Between the Extremes, is a relatively short, argument-driven account of his time in government. Its central argument is for the indispensability of reforming, liberal and centrist politics, premised in rational, evidence-driven policies, and a repudiation of the current wave of emotive, populist nationalism affecting many countries. Clegg emphasises the importance of political compromise, as well as the difficulty, once in office, of ‘selling’ compromise to voters. He writes almost fatalistically about the related problem facing the smaller partner in a coalition government, namely being disproportionately blamed for unpopular policies (if the tuition fees debacle hadn’t so undermined public perceptions of the Liberal Democrats, he surmises, some other issue would probably have had a similar impact). Clegg focuses almost entirely on domestic politics and policy, and this is where I would expect most reviewers to concentrate. In contrast, readers like me, who approach the book hoping for insights into the foreign and security policies of the 2010-15 government, will find curiously little detail, but several elusive allusions to points of tension. Clegg, Deputy Prime Minister and vice-chairman of the National Security Council (NSC) throughout the Coalition government, states that there were overall relatively few disagreements about national security issues during the Coalition. There were, however, several differences of opinion over policy and broader strategy, especially regarding then Chancellor of the Exchequer George Osborne’s ‘undignified dash to China to implore them to build our nuclear power stations for us’ (201). More generally, Clegg implies that there were differences on Middle East policy; but the only foreign policy issue meriting a chapter in its own right is Britain’s relationship with the European Union, as might reasonably be expected given the topic’s high degree of domestic salience, Clegg’s avowed pro-European convictions and his background as a former Commission official and MEP (the dust-jacket’s back-flap reminds us, incongruously, that Clegg can speak five European languages). That’s not to say Clegg’s readers will learn nothing about Coalition foreign policy and national security decision-making. We gain some insight into the mechanics and dynamics of the NSC. Clegg confirms what others have claimed elsewhere – that it was sometimes hard for the Liberal Democrats to influence the NSC’s discussions or even to get things on the agenda. He notes that it became a ‘running joke’ that his repeated efforts to force an NSC discussion on Britain’s strategic relationship with Europe were constantly thwarted. The process for shaping the NSC’s agenda requires ministerial members to suggest topics through the National Security Adviser (NSA) for the Prime Minister’s ultimate decision. Clegg forlornly persisted in asking for a strategic discussion of Europe, but David Cameron never acceded to these requests (203-04). Despite this failure regarding Europe, Clegg writes that the NSC’s dynamic was ‘largely consensual and cooperative’. He attributes this, in part, to his own view that ‘whatever other differences we had in the coalition, on core issues of national security it was important that the government should present a common position’. Clegg also notes that the scope for disagreement was reduced by David Cameron’s preference for discussing ‘operational defence matters, such as troop movements in Afghanistan, on which he appeared to have a clear grasp of the detail and there was no cause for party political argument’ (79). This is consistent with observations from other former NSC attendees, such as former Chief of the Defence Staff Lord Richards, that Cameron’s NSC failed to engage with deeper, more strategic issues. Clegg also criticises a tendency towards ‘erratic changes in Conservative foreign policy’, especially in its reportedly fleeting and faddish embrace of different countries and regions as being the priority of the moment: first India, then China and latterly the Gulf States. Through it all, Clegg consistently emphasises the failure of the Conservatives to sufficiently prioritise Britain’s leadership role in Europe as a precondition for its wider influence in the world (203). On other issues, Clegg found an ally in then Foreign Secretary William Hague during ‘behind-the-scenes debates about Israel and Palestine or the Middle East or China, where [Clegg] would customarily push for a harder line than the narrow realpolitik espoused by Osborne’ (202), a poorly drafted sentence that makes it unclear whether Clegg’s dispute with Osborne ranged over all these issues or solely China. One place where Clegg didn’t find an ally was the Home Office, which was run for the whole period by the current Prime Minister, Theresa May. Clegg criticises its response to his proposal that the UK should improve its treatment of Afghan interpreters, if necessary resettling them and their families in the UK (115-16). On domestic security, he laments the Home Office’s stance on digital surveillance legislation, and champions robust independent review of such legislation, citing a Royal United Services Institute (RUSI) review he commissioned whilst in government as one excellent example (112-13). Clegg evidently believes that May’s Home Office was too quick to defend surveillance legislation that was ‘past its sell-by date’ and unduly resistant to new legislation to improve transparency, and accountability to both the courts and parliament. More than once, Clegg opposes Osborne for pursuing a too-narrowly pro-trade and pro-investment approach to China, leaving readers to infer that Clegg would have preferred some kind of more robustly human rights-driven policy towards China: ‘too many of our politicians have rushed to embrace authoritarian capitalism: George Osborne’s gratuitous pandering to China’s rulers in Beijing in pursuit of commercial advantage springs to mind’ (226). The West’s failure to identify and implement a punchier policy towards authoritarian states is a wider lament, but isn’t amplified by alternative recommendations: Western governments appear ‘unable to stand up for their own values’, and Russia’s bombing of ‘Western-backed rebel groups within Syria – whilst failing to abide by any of the agreements in the frozen conflict in Ukraine’ – is ‘the clearest demonstration yet that authoritarian regimes around the world are now able to act with a degree of impunity that would have been unimaginable even a few years ago’ (226-27). It would have been interesting, appropriate even, for Clegg to articulate what he would have done differently had he not been constrained by the Conservatives. Clegg argues that one example of ‘Britain’s declining leadership’ in Europe is the way that the UK was excluded from Franco-German mediation in the Ukraine crisis in early 2015, with Chancellor Angela Merkel and President François Hollande failing to inform the UK about their joint diplomatic initiative, prompting Whitehall to react publicly, ‘desperate to cover up the indignity of the whole episode’ (214). Clegg lists several foreign- and security-policy related areas where Britain could and should have demonstrated more or better ‘leadership’ within Europe, e.g. cooperation with France on European defence, shaping Europe’s response to the refugee crisis and economic reform in Europe (215). It is disappointing that Clegg largely ignores the 2011 intervention in Libya (meriting one passing mention), its troubled aftermath and the protracted debate about UK policy towards the Syria conflict, including the ill-fated August 2013 parliamentary vote on military action. Similarly, he has little of substance to say about Afghanistan, Iraq or the group variously known as ISIS, ISIL or Islamic State (which features here only twice, fleetingly, as ISIS, the second time courtesy of a Sarah Palin quotation). It would be of great interest to read Clegg’s account of the major, non-European episodes in foreign policy debates during the Coalition, and it is to be hoped that he addresses them elsewhere in future. Judged by its own lights, the book sets out a spirited defence of the decision to take the Liberal Democrats into government, and of the kind of politics – rational, reformist and compromising in the best sense of the word – in which Clegg believes implicitly and which he placed at the heart of his governing agenda. Its most passionate and persuasive passages relate to topics integral to Clegg’s politics, like Britain’s place in Europe or the need for constitutional reform. Yet, the book will disappoint readers hungry for insight into the Coalition’s foreign policy, and even those who are keen for deeper insights into Clegg’s own career – for example, his experience of serving under the leadership of Charles Kennedy and Menzies Campbell at Westminster, or his subsequent and very closely fought leadership election victory over Chris Huhne. Perhaps this was inevitable: Clegg is still a serving MP and is young enough that he may yet have a political future ahead of him. Judicious decisions about how much to divulge today may make that future easier to navigate, but they do make for a less revealing book. 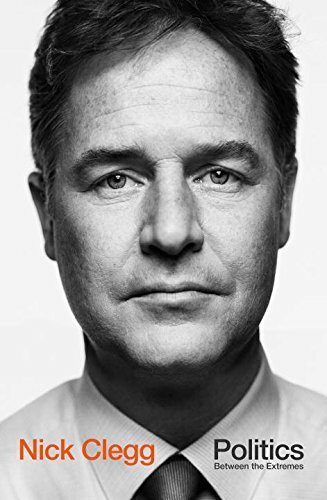 Early on, Clegg paraphrases Tony Blair’s lament that ‘the problem in politics is that you start at your most popular and least capable, and you end at your most capable and least popular’ (10). This engaging, reflective but ultimately rather narrow memoir offers readers insufficient evidence to assess the impact – positive or negative – of the Coalition on Clegg’s political capabilities. By contrast, the 2015 general election was an incontrovertible judgement on his popularity and his party’s political fortunes. In time, historians may offer kinder appraisals of Clegg, but this book is unlikely to be instrumental in revising perceptions of his record. This post represents the views of the author and not those of Democratic Audit. It was first published at the LSE Review of Books. Dr Joe Devanny is a Research Fellow at the International Centre for Security Analysis, part of the Policy Institute at King’s College London. Follow him on Twitter @josephdevanny. Read more by Joe Devanny. The similarity between all three parties in the run up to the 2010 election makes nonsense of any idea that Nick Clegg or his party were between the extremes – they were in the end superfluous because they were just another somewhere in the middle and appeared to have lost their way. So a better title for the book would be Dusty Springfield’s hit song of 50 years ‘In the Middle of Nowhere’. Telling indeed was the reference in the revieqw to his passion for the EU – remember those debates against Nigel Farage on tv in which the media within seconds said he had ‘won’?…and then an unheralded and delicious opinion poll of the public of the debate by yougov showed that Clegg had been comprehensively knocked off the field by Farage, losing the debate by a landslide with the public (if not with the cossetted elite and its running dogs). There’s a lesson there for small parties going into actual coalitions (see the Greens in Ireland for the already-disastrous lesson…you were warned Nick). Without real passion and with simply a dull determination to cling onto office (or the appearance of it), such parties will just disappear, to use the old revolutionary term, like so much chaff on the wind. It’s now down to the LibDems to revive from local politics up, that will be their saving grace.